Super long title I know but in my last post I named the upcoming post already. Then I got to thinking that really what the post is about is making your school room work. That has been our issue for several years now since we’ve moved to my mom’s house. We’ve had small houses before but just not having to share our space for five people with someone who has different “space” views than we do or needs for that matter. You’ll see our theme of super heroes in areas of our space but in general we keep what we need or use the most and other stuff gets put in rubber maid containers or drawers for easy access later but stored in the corner of the boys’ room. Not ideal but then we don’t have a ton of stuff either just mainly art supplies, AO books for later years, general science & history books, and basic extra school or craft supplies that you don’t want to keep buying. This is the bookshelf that sits next to our dining room table. It is smaller than our normal bookshelf but fits the space available to us. Since this picture, I’ve redone the shelves and hope to repost a new picture for you. The top shelf is our nature shelf. It holds several of our nature guides plus a bird log that I picked up at a used store. We have not begun to use it yet but hope to soon. I’m mainly the only one who likes to keep lists or draw the birds in the yard but that is okay with me. It doesn’t show well in the picture but holding all our finds is a two tray divider from Wal-mart. We first got the tray to use in our fridge but no one except me was using it for what it was intended so I took it out. Instead of wasting money on the tray I re-purposed it for our nature shelf. It is clear so everything can be see at a glance plus it is easy to clean when needed. I took a couple of felt pieces and laid them in the bottom so things would not slide around as much when the tray is handled. It holds our microscope ( just a cheap one for now), blank slides, three magnifying glasses, tweezers, pine cones, acorns, pine straw, empty snail shells, shells from the river, rocks from our yard and from our travels, as well as some other finds. You can see our soap boats from Paddle to the Sea on that shelf also. We also have a plant that we haven’t gotten around to putting in the soil yet but was supposed to be used as a terrarium for D’s birthday so he could put dinosaurs under the plant. Well, you can see how well that went. The next shelf holds our AO books. 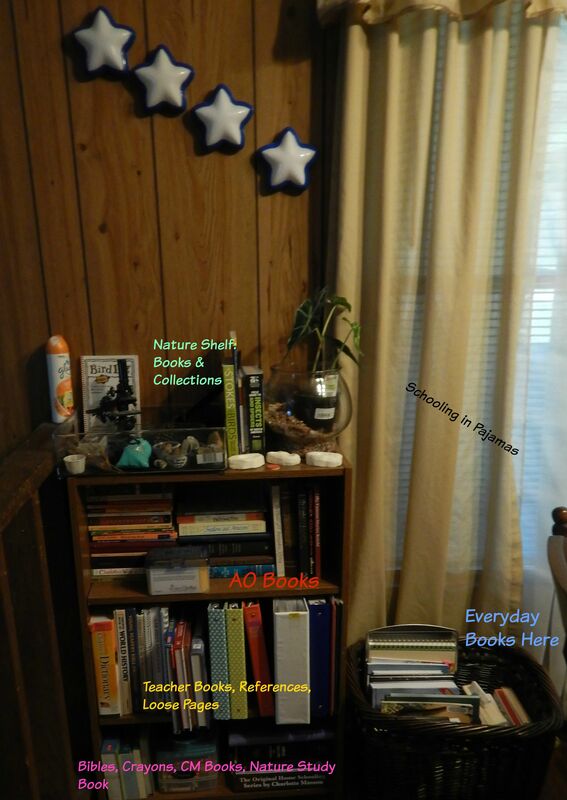 In the picture it is just all our books laid out plus a few other books. I recently redid this due to purchasing some books for this year and finding some for other years. I placed the books we have for years 0-2 on the shelf. Books for other years are going into a plastic three drawer organizer. Years three and four share a drawer then all other years are together in one drawer. My older son has some later AO books on his personal shelf that he has read and used in his own school at some point and I have let those stay for now. The third drawer is used for extra books for any AO subject that I find. The next shelf on the bookcase is for reference books such as our dictionaries and encyclopedias along with any books I want to keep within reach. I also keep any teacher books, planner books, and the pages for Miquon math on this shelf. Extra handwriting paper is kept on this shelf also. The last shelf holds our Bibles we use for school, the large crayon holder, and my Charlotte Mason books plus The Handbook of Nature Study. I do not have all my books dealing with CM on the shelf as I keep those written not by CM herself on my personal shelf in my bedroom. During school, I want to go straight to CM herself then if I need clarification I usually pull out my phone or go to the computer and look on AO or the AO forum. When I still don’t get it, then I go to my other books. I keep a large wicker type basket beside the bookshelf that holds all our everyday/weekly books. Since I sit closest to the bookshelf, this helps me immensely. I just have to lean over and pull the book(s) out and away we go. It also helps when I need D to get a book. I just tell him to go to the basket and get so and so book. I have started keeping my planning notebook in the basket also. With an upcoming surgery, I have to make things as simple as possible for when I need others to help me out. Starting now will make the habit much easier when it is needed. This area is on the other side of our dining room table. It is the china cabinet that my mom insist can not be moved out of the house into storage. So I have moved the cabinet and turned it sideways so that it blocks a small portion of the curtained doorway leaving the window open for light and more space for the huge six person matching antique table that she also seems to have to keep in the house. Such large furniture for a small space makes moving around a bit awkward but we make it work and this is how. I’ve numbered the picture for simplicity. #1. I got lucky right before school started and helped a friend move into her new room at the school. I was able to go through stuff and grab what I could from things that were simply gonna get thrown away. The three tubs at the top are from the Dollar Tree and store my finds from her room. The blue tub house nothing but blue foam cuisenaire rods. Like a whole thirty kid classroom set of them! The red tub I already had and is more like a book or magazine type holder. It was from the Dollar Store once upon a time and currently stores tons of linking cubes of different sizes. The orange tub is filled to the brim with other math manipulatives such as wooden cuisenaire rods, wooden blocks, paper money, plastic coins, small wooden Judy clocks, a money game, tanagrams, colored counters, and more. I didn’t through much away because we all know these things can be used for so much more than math. #2. This is one of those multi-pocket organizers they sell right before school starts. I picked this up a couple of years ago for around $9 but no more than $12 I think. I hung it using heavy-duty command removable clips. Things hanging out in it are sentence strips, math work mats, maps, cursive alphabet, All About Spelling Tiles, and scissors. Just a few things I may need to grab quickly that don’t have space on the bookshelf or in the book basket and shouldn’t be stored away in the plastic tubs. Above the organizer, are a stack of US maps that I got from friend. I bought a cheap $1 pack over sized clothespins from Dollar General and are using them to clip the maps to the cabinet’s edge. Gives them a place to hang out and hides the command clips from sight. #3. Here are the over sized clothespins in action again. Here they are holding our poster of the solar system. This will be the area for our posters or maps. I can rotate as needed or hold several up and just switch which is in front as needed. I got a huge stack of posters from my friend also. Some are in great shape and some not so much but I can still work with them so I couldn’t pass them up. #4. This area is a free for all type area. It holds the artist print we are studying and our vocabulary stand. The vocabulary stand I also bought several years ago on the cheap when school supplies were for sale before school started. It opens like a triangle to stand on the table with two sides for holding sentence strips. We use it for note cards, sentence strips, and pictures. Basically more than it was advertised. When not being used, I fold it and lean it against on the shelf and against one of the doors. I also print out the artist picture we need then using the clear square poster tabs, place it on a small canvas. I use the kind that is open on the back like to hang so that I can tape a post it note to the back with the artist and other notes to it. #5. We hang his backpack on the knob for one of the drawers. This keeps the bag from getting lost and the stuff inside from getting used for other stuff. Nothing like finding a school notebook being used for random drawing paper when it’s needed. I don’t have any pictures of it but we have also taken over the front of the refrigerator. We use it as our word wall and tape vocabulary words to it. Not all our vocabulary words are put on the fridge but enough of them and usually ones I really want him to remember or use or that are used over a length of time such rotate and revolve during our astronomy unit. Everyone learned something when we added septillion to the word wall. Can you guess what septellion means? Hint: it involves a one and lots of zeroes! !